This book examines the state of strategic communication as a discipline and how it has emerged as a unique area of scholarship in the beginning of the 21st century. Strategic communication encompasses all communication that is substantial for the survival and sustained success of entities like corporations, governments, non-profits, social movements, or celebrities. A major aspect is the purposeful use of communication by an organization to engage in conversations of strategic significance to its goals. The contributions in this book provide unique insights, make compelling arguments, and highlight promising areas of scholarship in strategic communication. 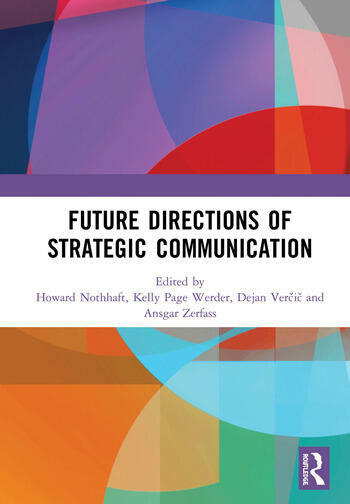 Presented in four parts, the chapters explore the emergence of strategic communication, its conceptual foundations, its expanding body of knowledge, and the foundation for further development and new directions in the field. Of interest to those studying communication from the perspectives of communication science, management theory, organizational studies, or business administration, this volume will also be useful for readers who are new to strategic communication, and who are interested in the field for its new avenues of research. This book was originally published as a special issue of the International Journal of Strategic Communication. Howard Nothhaft is Associate Professor in the Department of Strategic Communication at Lund University, Sweden. His research interests include strategic communication theory; the democratic impacts of corporate communication; and techniques, stratagems and strategies of counter-influence. Kelly Page Werder is Associate Professor in the Zimmerman School of Advertising and Mass Communications at the University of South Florida, USA. Her expertise includes strategic communication message effects, campaigns, corporate social responsibility, and stakeholder activism. She is the Editor of the International Journal of Strategic Communication. Dejan Vercic is Professor and Head of the Department of Communication at the University of Ljubljana, Slovenia; and partner and knowledge director for the consultancy Stratkom. He is a recipient of the Pathfinder Award, the highest academic honor bestowed by the Institute for Public Relations. He is a founding member of the European Communication Monitor research team. Ansgar Zerfass is Professor and Chair of Strategic Communication at Leipzig University, Germany, and Professor of Leadership and Communication at BI Norwegian Business School, Oslo, Norway. He is the Editor of the International Journal of Strategic Communication and has received the Pathfinder Award by the Institute for Public Relations. His areas of research are corporate communications, communication value, and international communication.